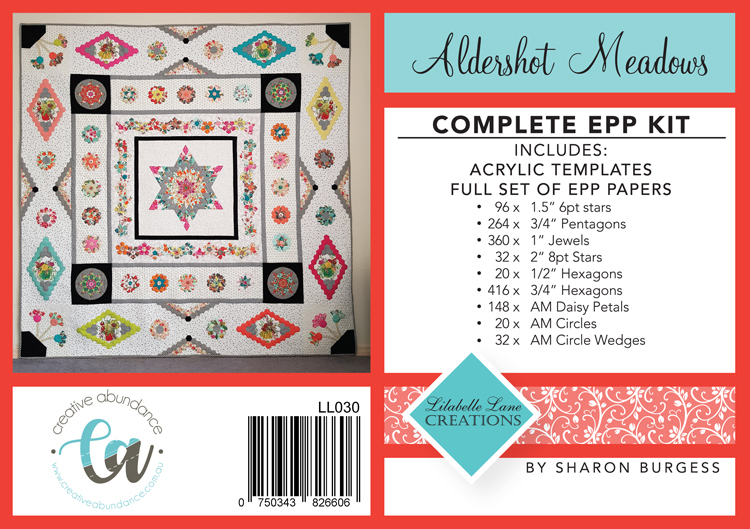 Aldershot Meadows EPP Kit – Papers and Templates ONLY Please note that the pattern will be published in six instalments in “Homespun Magazine” throughout 2019 and IS NOT included in this kit. Aldershot Meadows will take you through a journey of flowering blooms, each as individual as the maker and where no two blooms are the same. As the meadow begins to grow and bloom you will play with English Paper Piecing, applique and machine piecing. This quilt has many elements that can be fussy cut but at the same time it does not need to be fussy cut, the preference is the makers. The quilt will be delivered in six instalments and over the course of the year you will build your medallion styled quilt which will finish at 80” square. The complete EPP Kit contains the following templates and the required number of papers for the quilt without the need to reuse any papers.